Hello, all! 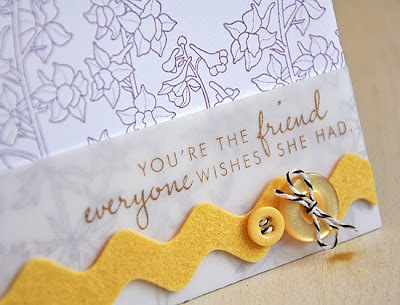 Today's card is one that I submitted to the last Paper Crafts call. It was based off of one of the call sketches. But, as you can tell, it didn't get picked up. No problem though, because now I can share it with you!... Stamped a row of flowers, from Year Of Flowers: Larkspurs, in Plum Pudding onto a white card base. Wrapped the base with a strip of vellum and stamped with a sentiment in Dark Chocolate. 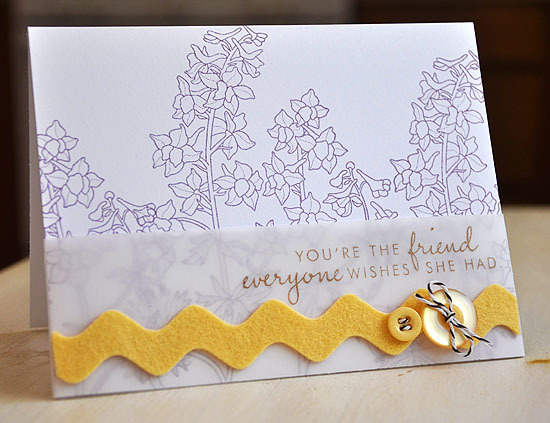 Here's A Tip: To attach the vellum strip, cut strip slightly longer than the width of the card base, fold and wrap excess around the edges and apply adhesive onto the inside of the card base. Attached an extra large Harvest Gold rickrack felt border and embellished with Harvest Gold buttons and baker's twine. Thanks for visiting today! Hope you have a good one! Beautiful Maile! I just picked up this set! I can't wait to use it. I love how you didn't color it! This is quite simply beautiful. I must have this set now...love it! Girl this is so pretty! Love the use of vellum! SO pretty! I love the pop of color the rick rack adds! Nifty card! Simple, clean, refreshing. I know just the sketch you're talking about, and I LOVE how you interpreted it. This card is beautiful. love the beautiful color combination and design! beautiful card, Maile! Just love this design - beautifully simple and so elegant! Fabulous!